PEACE OF MIND – ACCIDENTAL DAMAGE WAIVER: We offer Security Deposit Insurance in lieu of a Cash Deposit ($500.00). This Security Deposit Protection plan covers unintentional damages to the rental unit interior that occur during your stay, provided they are disclosed to management prior to check-out. The policy will pay a maximum benefit of $3000.00. Any damages that exceed $3000.00 will be charged to the credit card on file. If, during your stay at one of our Rental Properties, an Insured Person causes any damage to real or personal property of the unit as a result of inadvertent acts or omissions, the Insurer will reimburse the Insured for the cost of repair or replacement of such property up to a maximum benefit of $3000.00. Certain terms and conditions apply. Full details of the Security Deposit Protection coverage are contained in the Certificate of Insurance or Insurance Policy (www.vacationrentalinsurance.com/10sdi ). When payment for this plan is made, you authorize and request CSA Travel Protection and Insurance Services to pay directly Grand Strand Vacations any amount payable under the terms and conditions of the Security Deposit Protection. Please contact Grand Strand Vacations directly if you do not wish to participate in this plan or assignment. We trust that the families vacationing with us will treat their beach home as if it were their own. We will require a valid Visa/MasterCard to be held at the time of booking. A Credit Card is required to make you reservation. Please report all damaged or broken items immediately . LINENS : For your convenience, sheets, pillow cases, towels, wash clothes, hand towels, and bath mats may be included in your rental. Sofa Bed linens are not included in the linen package but may be added at no cost on request. VACATION RENTAL INSURANCE: is available to you for your vacation. Grand Strand Vacations and Rentals is unable to refund due to HURRICANE EVACUATIONS. If you have purchased vacation rental insurance, then CSA will not refund based on the number of days under mandatory evacuation. This insurance also protects you and your family if an emergency family illness or death should occur and prohibit you from vacationing. We recommend you purchase this insurance for your protection. A pamphlet with detailed insurance information has been included with this rental lease agreement. You may call CSA Travel Protection for further information at 1-866-999-4018. DEPARTURE CLEANING: Departure cleaning is provided on all rentals. We ask that you please, remove all trash, wash & put away all dishes, secure the property and follow the instructions we supplied. 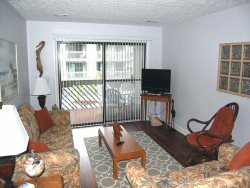 OUR VACATION RENTAL PROPERTIES ARE ALL PRIVATELY OWNED PROPERTIES: and reflect the individual tastes of the homeowner. We cannot make changes to equipment or furnishings. Guest agrees not to move, change, break, remove or destroy any item(s) belonging to this rental property. Equipment & furnishings are subject to change without notice or compensation. NO HOUSE PARTIES: (A) We rent strictly to families and mature persons over the age of 25. (B) Absolutely, No House Parties, Fraternities, Sororities, Motorcycle or Youth Groups Allowed. (C) No Children under the age of 25 will be allowed to check-in-without their parents(s). (D) Parents must occupy the same property during the term of this agreement; adult supervised no-family groups are considered house parties. (E) Should a house party or group attempt to occupy the property by any devise, they will be immediately evicted and/or admittance refused and the Reservation Deposit. (F) The person(s) will be responsible for any and all legal fees, and any other expenses, which may result, in addition to any right or remedy available by law. PET POLICY: Pets are permitted in designated pet friendly properties. Ask for details. Pets are prohibited in all other properties. Violation is a material breach and is grounds for immediate eviction. No exceptions, no refunds. WHAT YOU NEED TO BRING: Beach towels, a cooler (for frequently used items), cleaning supplies, and your paper products. Properties are set-up for simple cooking and housekeeping. Property items (such as Bedspreads, Pillows, Chairs, Pots, Pans, Dishes, Glasses or Silverware) are not to be taken out of property (to the beach or other properties). TELEPHONES: Not all properties have telephones. No long distance calls are to be placed unless they are collect or billed to your credit card. Many of our units have telephones with toll restriction, which prevents anyone from dialing long distance. No collect calls are allowable on phones with this feature. Guests will be charged a $20.00 fee for unauthorized calls billed to owner. OUR IN-HOUSE MAINTENANCE AND HOUSEKEEPING STAFF: are here to make sure that your vacation home is in the best condition that it can be. If you should discover otherwise, please report it to us immediately and we will correct it as quickly as possible. Check Out is not the time to let us know about problems. We cannot issue refunds for mechanical breakdowns or cleanliness issues. In order to make timely repairs or inspections, Grand Strand Vacations and Rentals’ personnel or representatives shall have the right to enter the property at reasonable hours. If a service call is made and entry refused, renter will be held liable for service call fee. Pest control is handled by the Homeowner Associations. While we make all efforts to control and report issues, we do not have the ability to insure prompt response should a need arise. LOST AND FOUND: we cannot be held responsible for items left behind in our rental units. We do make every effort to locate and will return them to you for a $20.00 fee plus postage. RENTER RESPONSIBILITIES: As the renter you will be held responsible for any malicious damage, loss to the property, or excessive cleaning required during your rental period and Owners Agent will repair or replace lost or damaged inventory at the renter’s expense payable upon demand. *There is a $25.00 Lost Key Charge for keys not returned. Homeowner Association rules are also the responsibility of the guest and any fines levied against the property while they are staying there will be charged to the guest. After Hours calls to provide entry because of misplaced keys are charged at $50.00. SUBSTITUTION: From time to time, properties become unavailable for rental due to unforeseen circumstances including Real Estate sale. If this should occur, we at Grand Strand Vacations may provide renter with substitute, comparable accommodations without notice for the same period of time. If comparable accommodations are not available, rents or deposits will be refunded. We are not responsible for loss of reservation due to sale of property. SUBLETTING OR ASSIGNMENTS: The person whose name this reservation is in must occupy Vacation property for the duration of rental period. If a change needs to be made, please contact our office. NON-LIABILITY AND INDEMNIFICATION OR OWNER’S AGENT: Renter agrees to indemnify and hold harmless the Owners Agent from any and all costs, expenses, legal proceedings, attorney fees, suits, claims, or demands. Whether from loss of life, damage to rental property, theft, or injury to the Renter, renter’s family, guests, and/or visitor entering the property or the building or grounds in which the Property is a part, unless the same was due solely to the gross negligence of the Owners Agent. Renter waives any and all security provisions. DEFAULT BY RENTER: Renter understands that upon violation of any condition, agreement, restriction, covenant and/or obligation of this agreement, the Owner’s Agent my terminate this Agreement and enter this property by force or Statutory proceedings. In which case any and all monies paid by renter will be forfeited by the Renter as liquidated damages in addition to and not in lieu of any right or remedy available under law. Parking is limited to two vehicles in most cases. CANCELLATION POLICY: If you cancel, your reservation deposit will be refunded, less $100.00 ($100 cancellation fee)if outside of thirty days of arrival. If inside thirty days of arrival, all payments will be forfeited. NOTE: VACATION RENTAL INSURANCE WIL NOT COVER CANCELLATION FEE OF $100.00. EVENT FEE: $1,200.00 Fee for Weddings, Family or Class Reunions, or any event that exceeds the maximum occupancy of the property. SECURITY DEPOSITS: A security deposit may be required upon management discretion, due to age and or number of occupancy. The deposit will be returned once the property has been inspected and there is no damage or excessive cleaning necessary. Deposit may be kept in whole or in part when there is evidence of smoking in designated non-smoking properties. REPAIRS & SERVICE CALLS: We cannot guarantee against mechanical failure of heating, air conditioning, TVs, VCRs, or other appliances. While rare, all pools/hot tubs are subject to temporary closing due to extenuating circumstances. Grand Strand Vacations and Rentals are not responsible for any circumstances beyond our control, such as disturbances on nearby properties, construction noise or debris, or acts of nature. Please report any inoperative equipment to our office promptly. We will make every effort to have repairs made quickly and efficiently. Please note that we are unable to offer refunds for failure of any equipment in the property. EVERY EFFORT IS MADE TO ENSURE THAT THE INFORMATION IN THIS RENTAL AGREEMENT IS ACCURATE AND COMPLETE. HOWEVER WE CANNOT BE HELD RESPONSIBLE FOR POSSIBLE TYPOGRAPHICAL ERRORS OR CHANGES IN FURNISHINGS, EQUIPMENT, OR BED ARRANGEMENTS.